Growth hormone-releasing hormone (GHRH) and somatostatin are the most important hypothalamic neurohormones controlling growth hormone (GH) secretion. Several neurotransmitters and neuropeptides also play an important role in the control of GH secretion, mainly acting via modulation of GHRH and somatostatin. In the past two decades, particular attention has been given to a new family of substances showing a strong GH-releasing effect: GH secretagogues (GHSs). GHSs increase GH secretion in a dose-and age-related manner after iv and even oral administration. 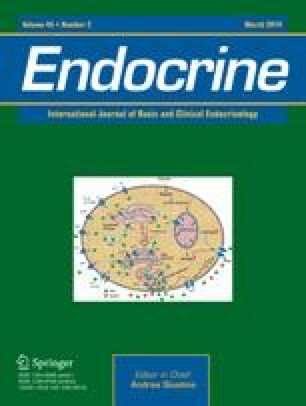 The endocrine effects of GHSs, are not fully specific for GH; they show, in fact, prolactin- (PRL), adenocorticotropic hormone- and cortisol-releasing effects. Specific GHS receptors are present in both the central nervous system and peripheral tissues, where they mediate several extraendocrine effects of GHSs. The isolation of these “orphan” receptors suggested the existence of an endogenous GHS-like ligand that could be represented by a recently discovered gastric peptide, named ghrelin. The interaction between GHSs and GHRH at the central level and in the pituitary gland, but not at peripheral level, has clearly been shown. Because GHRH and GHS receptors share the same localization in some peripheral tissues, they may have some interactions even at this level.